But, if that same great content is posted on social media again later, then it is able to reach a far greater audience. This sounds obvious, right? The problem is, we often fail to take this basic step toward significantly improving the traffic on our blogs. Why is that? Are we afraid of spamming followers with repeat posts? Do we think that all old content is irrelevant? Do we believe that content that performs poorly will always perform poorly? 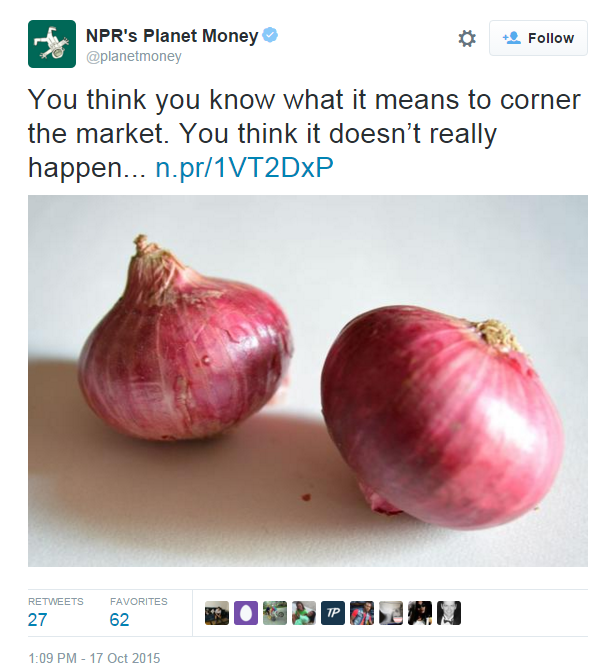 Sometimes we post the right content at the wrong time. 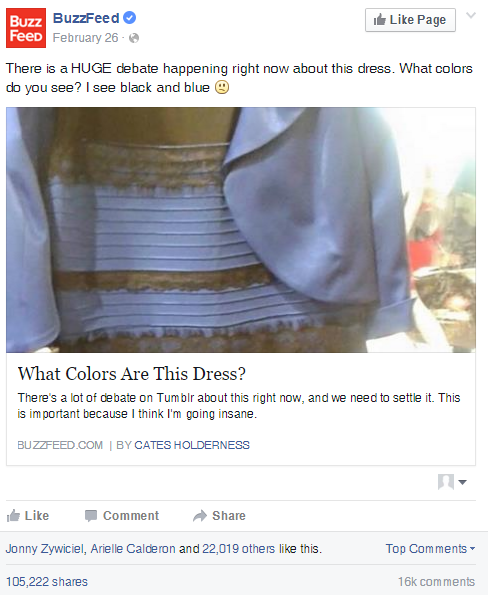 This is what happened when Buzzfeed posted the blue and black/white and gold dress picture on social media. While Buzzfeed’s Twitter followers loved the post, Buzzfeed could not get it to take hold on Facebook. They tried posting the dress as a link, but the post still failed to get the engagement they wanted. Buzzfeed decided to post the link one more time. The post took off and went viral. A great deal of blog posts are not time-sensitive. 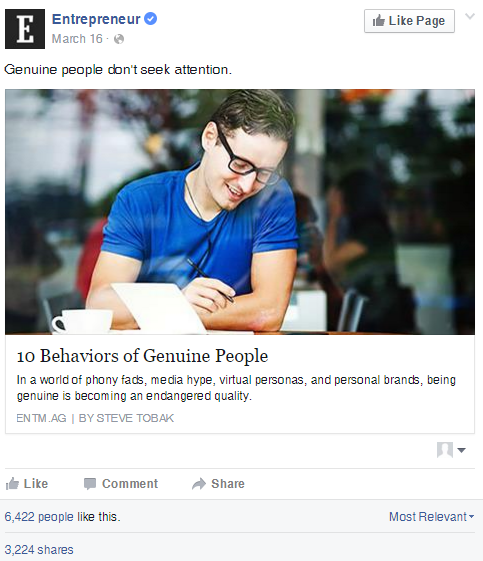 These posts have the ability to become more popular over time, earning themselves the title of “compounding posts”. According to Hubspot, compounding posts typically account for about 30% of a blog’s traffic, while only making up about 10% of all blog posts. It can take a few hours or even longer to write a great blog post. It only takes a few minutes to write a new Tweet or Facebook post to drive people to your blog content. Each time you re-post old content on social media, any new likes you receive are essentially free. The best way to start re-posting is by changing some basic variables in the way you post. Try changing the time of day or day of the week that you post. Some users only have time to check their Facebook and Twitter feeds at a certain time or day of the week. Some users may be in different timezones. 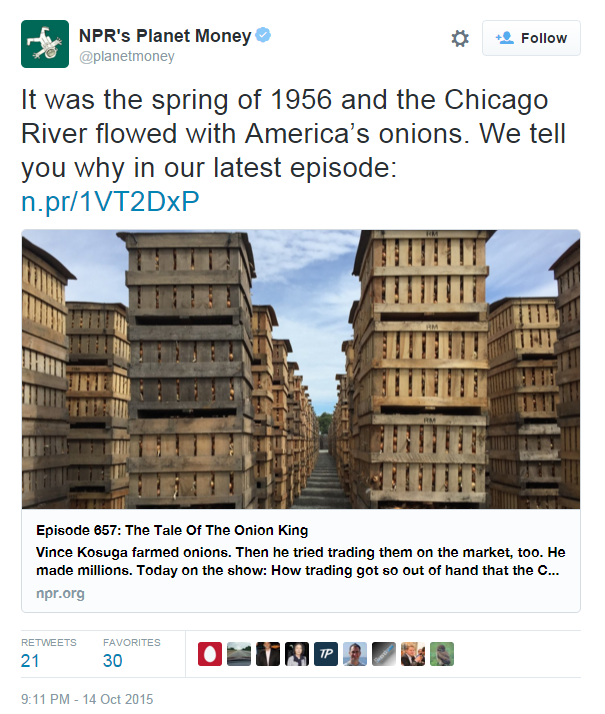 NPR’s Planet Money Podcast posted a link to the same podcast episode three times over a period of only a few days on Twitter. They first tweeted a little after 9PM on Wednesday October 14 and received over 20 retweets. The following day they again posted, this time just a little before 9PM and received a few more retweets and favorites. Finally, on that Saturday at around 1PM they received their biggest response out of the three tweets promoting their podcast episode. These three tweets together received over 50 retweets and over 100 favorites. 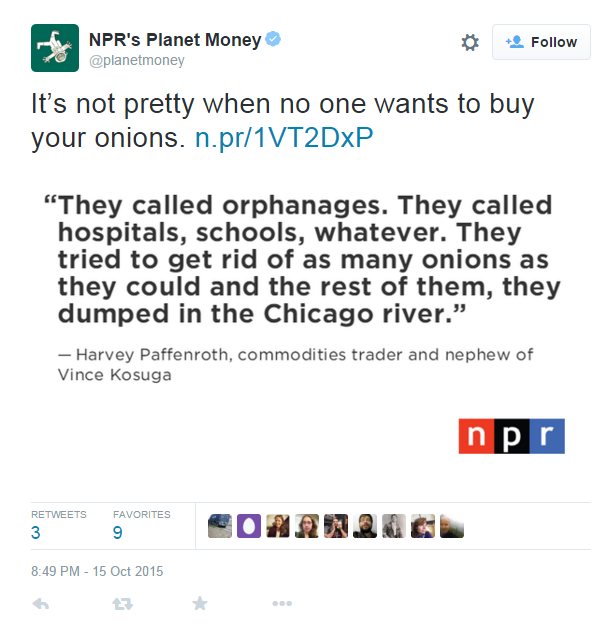 That is nearly twice as many retweets and over 50% more favorites as the most popular tweet of the three. 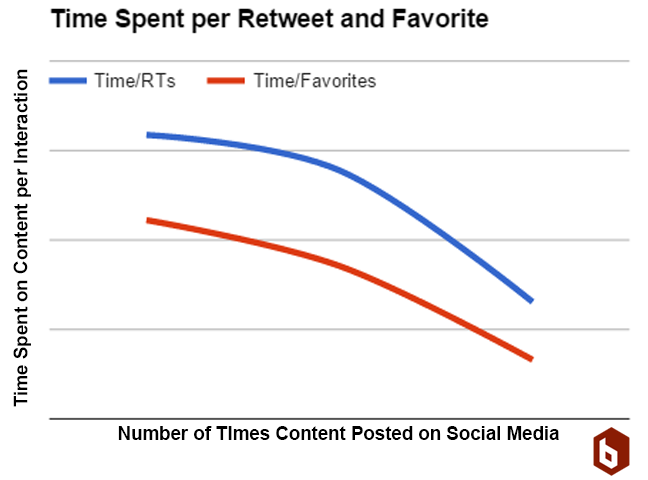 The chart below shows how each time they tweeted a link to their content, the average amount of time spent creating their podcast episode per interaction they received on Twitter decreased. When re-posting, it is crucial that you, at a minimum, phrase your new social media post differently. This is one way to safeguard against your followers thinking that you are spamming them. Try changing your language to suit a different audience. Try using new hashtags. Or try injecting some humor into your posts. Here is a perfect example of successful re-posting by Entrepreneur magazine. The first time Entrepreneur posted the article on social media, the post was quite successful, earning over 5,000 likes and nearly 3,000 shares. Nearly seven months later, the magazine posted the same article on Twitter with a message that was different from what they had used months before. It was a huge success. 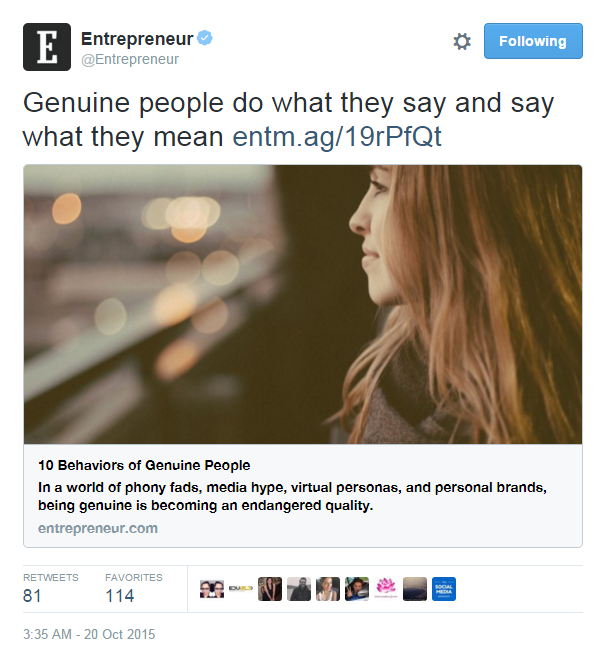 The tweet earned over 80 retweets in its first eight hours, making it one of Entrepreneur’s most popular articles on Twitter that day. At the end of October, they posted it on their Young Entrepreneur Facebook page, earning them another 1,400 likes. On November 6th, Entrepreneur Philippines posted the story for additional 600+ likes. Can’t figure out what to post on Facebook today? Dig through your blog and find a popular piece of content. Do not be afraid that you are posting it twice. You took the time to write a fantastic blog post. It deserves to be read by as many people as possible.